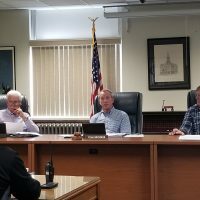 As budget discussions come closer to a conclusion for FY20, the Des Moines County Supervisors met with representatives from the Sheriff’s Department to discuss pay for deputies and administrators in the department on Friday. The Supervisors signed off on a 3% increase for sergeants, and a 4% increase for lieutenants this year, however fell short of the 6% and 12% increases the Sheriff’s office was asking for. Currently sergeants are making 9% and lieutenants making 18% more than a deputy’s base wage of $57,479. That salary will increase to $63,801 for a sergeant and $70,124 for a lieutenant. The supervisors showed some support for figuring out a long-term plan for further increases over the next several years as well. The go-ahead was also given to increase salaries for two employees at the Des Moines County jail. A requested $10K increase for an administrative assistant at the Sheriff’s office was not approved. The supervisors will continue finalizing their FY20 budget over the next few weeks, budgets generally have to be filed by early March.